Come rain, come hail...its Wednesday today! The weather packed up on Monday evening. Misty clouds, icy winds and no stars on the blackish grey sky. Madan, the night watchman and my fellow companion for the daily-last-doggy walk, refused to comment on possible rain–we had been fooled umpteen times this winter. Clouds would invariably fly off, the forests were becoming dry and dusty, and coughing was the order of the day. Tuesday, however, was a lovely rainy day. If you were not out on the road, it was the perfect day for sitting in bed, drinking hot tea, and listening to the hail and thunder and rain. Every apartment owner had given their maids an off, which meant that I just kept climbing up and down to the soggy forest floor, wiping the dogs dry and clean, and missing Hema. Snow did not fall on our patch of land, but further ahead, there was white snow on the foothills and apple orchards of Chaubatia. Wednesday turned out to be a cold, grey, formidable and wet day. Not a patch of blue sky or white clouds. Woke up to thunder and drizzle, and the main thought was about the knitters getting ready to come over for their Wednesday session of knitting and meeting. If I was in their place, I would not have stepped out of my home..I would have made an excuse, or just remained quietly at home. And then, there were jeeps halting on the road, there were quick footsteps on the stairs, and the knitters walked in. From different villages in different directions…in different stages of being soaked, but everyone had their smile and sparkle intact. We gathered for our morning…completed shawls were weighed and registered, new mufflers were started, laughter and knitting needles clicked and no one cared about the weather outside. Hema made copious amounts of tea, delectable wedding sweets were eaten ( thank you for that amazing kaju barfi, new in-laws of my niece! ), and it was just another day for needlestosaymore. I read out and translated this article for all the knitters today. And lo behold, the same words had been shared with the author! 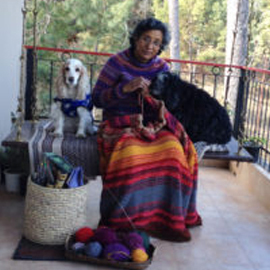 I know for sure now…Wednesdays are not just my weekly recharge day for knitting, bonding, oxygen and love…Wednesdays are the weekly recharge day for knitting, bonding, oxygen and love for the rest of the knitters too. PS…this is being posted on Friday, when the Internet Gods turned merciful again!